Fitness Savvy searched far and wide and discovered 8 online customer reviews of the Life Fitness G7 Cable Motion Gym. Overall, this cable machine scored a solid 95% (4.8 out of 5), with users praising the versatility, range of exercises, smooth operation and build quality. If you’re looking for a high-end cable machine to add to your home gym setup, the Life Fitness G7 multi gym is a serious contender. Featuring dual-adjustable pulleys, this exercise machine is versatile and challenging. 73 kg (160 lb) dual weight stacks: independently exercise each side of your body. Think about it: when you have just one weight stack, you need to operate that with both hands (or just one). With dual weight stacks, more exercises can be performed and body imbalances can be addressed by changing the weight for one side. 20 ultra-smooth pulley adjustments per column. Quick-Lock cable end attachments: switching between attachments is super fast and easy. Bio-mechanically angled chin-up/pull-up bar: perform correct upper-body and core exercises. Training DVD: get fit by following along with a certified personal trainer. Space-efficient: fits easily in the corner of a room. Weight Stack: the G7 includes 2 x 160 lb weight stacks. However, the FT2 can be upgraded to 2 x 210 lb stacks. In total, the FT2 can go 100 lbs (45kg) heavier. 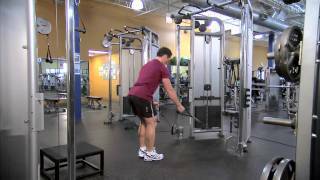 Smith Machine: the G7 does not include Smith machine function. Pull-up bar: so far as we can tell, the pull-up bar on the G7 is not adjustable. however, on the FT2 it is. This is useful if you are taller or have lower ceilings. Commercial use: the G7 is designed for light commercial use, whereas the FT2 is designed for heavy-duty commercial usage. We’ve included some useful videos in the reviews section at the top of the page. 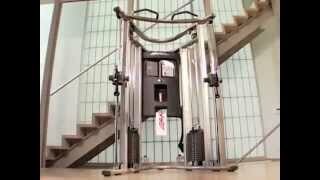 Check them out to find out more about the workouts you can perform on this gym machine. If you’re searching for the best Life Fitness G7 price, then you’re in the right place! As the UK’s first dedicated fitness price comparison site, we compare prices from a huge range of fitness suppliers including Argos, Fitness Superstore, Sports Direct, eBay, Amazon and many more. With prices fluctuating on a daily basis, it’s important to check back here first before you buy this multi-gym. This way, you’ll be sure to find out if it is currently on sale and get the best price – especially during special events such as Black Friday. In addition, we’ve added discount codes which might be relevant to this product. Check the vouchers below to see if you can save further on this product. If you’re searching for the Life Fitness G7 second hand, then don’t worry! You can either head over to Gumtree, or check out the eBay listings below. If you’ve lost your copy, or wish to check it out before you buy, here is a link to the Life Fitness G7 user manual. You’ll find parts lists, assembly and disassembly instructions and other useful info.